In August 2011 Waterford diver Eoin McGarry led the technical dive team on the expedition that was carried out by National Geographic Broadcasters for a two hour documentary special which will be aired in May of next year in time for the anniversary of the sinking of Lusitania. 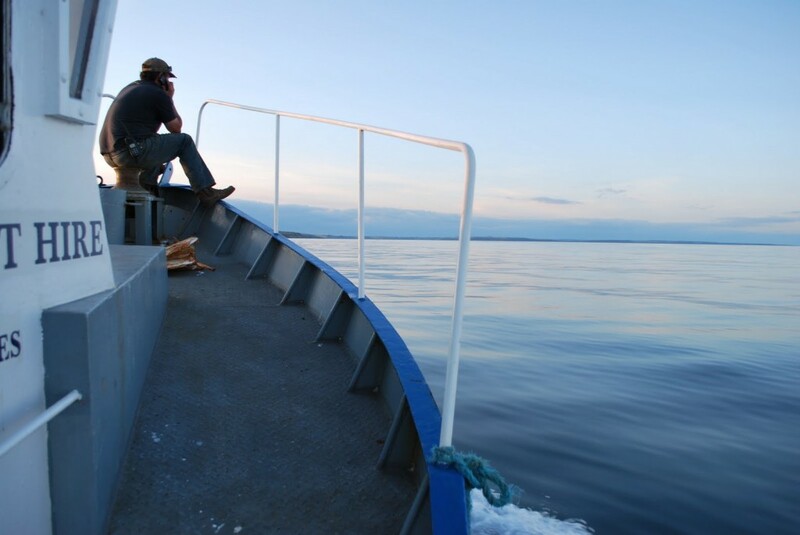 Due to contractual agreements McGarry cannot discuss the details of that expedition but the recovery of artifacts was executed by him and and a specialised dive team, and the details of that he reveals here to Afloat.ie readers. The recovery of artifacts took place on the 22nd of this month as a continuation of Gregg Bemis’s five year license. As recovery of artifacts was not on the Nat Geo agenda, their primary objectives were for a forensic examination of the wreck. Subsequently, it was decided by Gregg Bemis and myself to return to the wreck and recover some significant items from the wreck while his licence was still active. 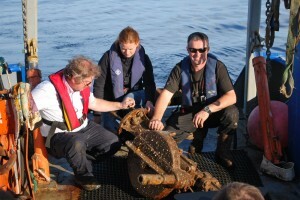 Agreement from the Irish Underwater Archaeological Unit and the National Museum of Ireland was necessary for this recovery to proceed as the surrounding site and wreck of the RMS Lusitania is a designated National Monument, and while carrying out the recovery we were monitored by the Irish Naval Service. Many hours of research involving global positioning satellite information, multibeam data and side scan sonar images of the site were carried out to determine the exact location from which to recover the objects. This is very important due to the physical size of the wreck site, as if you land in the wrong area of the wreck the dive could or would be wasted. 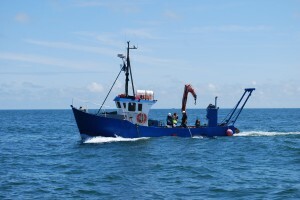 Once determined, the remainder of the proposed expedition had to be put in place, a dive vessel suitable in sized and also had to be able to cater for divers, a specially designed lifting vessel that would be able to recover the heavy phosphor bronze bridge telemotor, the dive team, all necessary paperwork and most importantly… the weather. Once all were in place, all were put on standby until a suitable weather window opened up, and that was to be the 22nd of Aug. The dive vessel was the “Harpy” owned and skippered by Karl O Donoghue out of Kinsale, the lifting vessel was the “Ron Carraig” owned and skippered by Gavin Tivy and Pat Waide out of Youghal, the dive team was myself Eoin McGarry who led and orgainised the recovery operation, Philip Murphy, Frank McKenna, John Corbett, Barry McGill and Stewart Andrews. 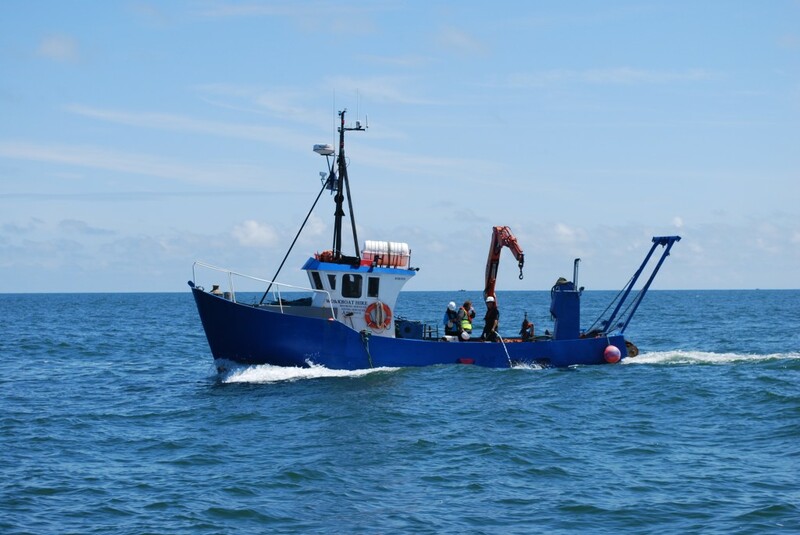 The wreck lies 11 and a half miles off the Old Head of Kinsale in 93meters / 300ft of water, which makes it a challenging dive, there are also the considerations of poor visibility, tangled fishing nets and unexploded depth charges to contend with. A dive with a half hour on the the wreck will result in a total runtime of 2.5hours, that is where the diver has to carry out the mandatory decompression stops or suffer severe decompression illness. lar dunne checking it over!! The items recovered were the bridge telemotor, a bridge tell tale indicator, 2 large square window type portholes with detailed filigris and 2 round type portholes. The recovered bridge instruments will be examined to see if they will yield vital information during the final moments of Lusitania as it was sinking. It is expected that some of these items will be donated to Irish museums. heading for kinsale ex wreck site !! A brilliant video. My interest in the Lusitania began in 1966 when I went out for a days fishing from Skull.The skipper called me to the Bridge to show me the Sonar Blip as we passed over the wreck of the Lusitania. This inspired me to become an Amateur Diver. I later became Chairman of the Manchester Diving Group whom I joined in 1967. I returned to Cobh in 2012,saw the memorial statue on the Quay Side. The Lusitania will always be a part of my life. Good luck to all who took part in the artifact recovery. I always wanted to dive on the wreck but the technology was not available in my time. © 2019 Seahunter. All Rights Reserved.